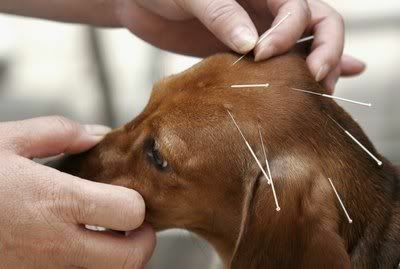 Acupuncture is considered an newer alternative health practice and is becoming more popular for furry family members. But acupuncture has been around a long, long time. I’ve written on this topic before and you can read my article about pet acupuncture but I got a question specific to dogs and thought I’d tackle the topic again. Acupuncture is based on the belief that energy, known as chi, flows through the body but can be upset or get out of balance due to injury or disease. To restore the healthy flow of chi acupuncture needles are placed at points on energy pathways known as meridians. Ancient Chinese acupuncture is thought to have originated in about 1,000 BC but scientists in 1991 found Otzi and the iceman’s therapeutic tattoos are believed to have been applied in 3,200 BC. You might find it interesting to know that one of the earliest records of veterinary acupuncture involved treating elephants some 3000 years ago in India. To become a canine acupuncturist takes years of training and a good investment of time and money. In most cases, people train for human acupuncture and then get additional specialty training and special certification. I was asked about the Animal Acupuncture Academy based out of Australia which is registered to David Gilchirst a veterinary surgeon. The site has been up since 2001 so it hasn’t been around a long time. Since the Animal Acupuncture Academy it is not an accredited program and doesn’t have any background history available, I’d encourage seeking education from one of the sources I list below instead. For instance, the International Veterinary Acupuncture Society which begins new sessions in San Diego, California and Atlanta, Georgia this October (2008) is a good choice. If you are in Colorado this September you might check them out by attending the 34th Annual Congress on Veterinary Acupuncture. Thirty-four years in exisitence is a good sign. Time investment needed to become a dog acupuncturist? Four to eight years. Each state has different certification requirements which can be located through an Acupuncture Society Standards Board in your area or the the American Academy of Veterinary Acupuncture. In addition, it would be a good idea to get some business training because running a practice requires record keeping and other skills. The Tai Sophia Institute in Columbia, Maryland. Cornell University College of Veterinary Medicine offers an introductory course. Colorado State University offers alternative programs read more on animal acupuncture. Again, investigate the International Veterinary Acupuncture Society for post graduate certification. An average treatment session may be as long as ten minutes up to thirty minutes depending how cooperative the dog remains. Fees for treatment start from around $50 and go up from there. The field is growing…remember when I mentioned SimDog? If not, I wrote about this teaching aid to help acupuncture students learn the proper needle meridian points back in March 2008 when Colorado State University’s College of Veterinary Medicine and Biomedical Sciences introduced the first simulated canine with a virtual reality interface. There are two views about studying for an animal career–be a generalist or be a specialist. I am a product of the generalist approach which has worked wonders because of my broad background, training and hands-on experience. However, specialty fields of practice are becoming more advantageous due to increased demands and vast advances in certain areas that can be hard to keep up with if you are a generalist. So, specializing in canine acupuncture would be a very specialist practice instead of attempting to treat various species but either way the field is growing. Canines also seem to be the animal many courses focus on…although I’ve come across some horse acupuncture charts and even a cat acupuncture video. Acupuncture has been effective for pain reduction but some skeptics still question the effectiveness on other issues. My thoughts? I see alternative services such as canine acupuncturist as a fast growing unusual animal career. What are the steps it takes in order to become an animal accupuncturist? how long does it take to have a degree in this career field?